Gino accent chair in a striking Zebra print adds texture and color to your decor. 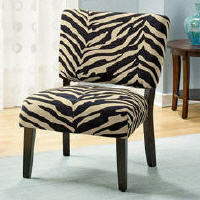 Comfortable and inviting this animal print chair features luxurious upholstery in polyester chenille. Sturdy construction from wood products and foam padding with wood legs in an Expresso finish. The animal skin pattern so much enhances this occasional chair that can be used as a pair with a table in-between or just alone as an accent. Dimensions are 26 1/2″ x 27 1/2″ x 34 1/4″H. Assembly required. Cannot ship outside the contiguous states 48 states or APO/FPO.